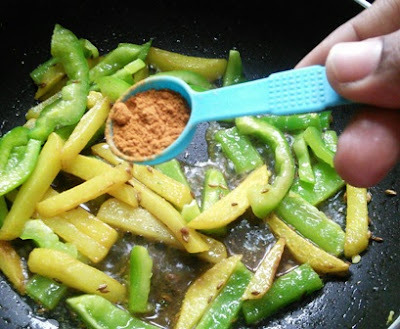 Capsicum(Bell pepper) potato masala (Dry side dish) - simple, quick and tasty side dish within 15 minutes. 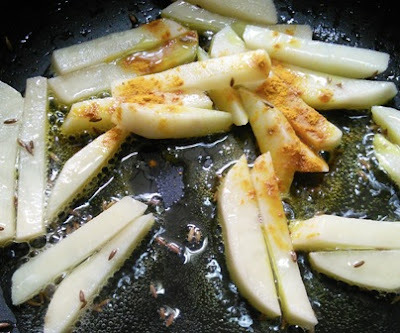 All you need for this masala is a handful of sliced capsicums and potatoes. The other ingredients are basic ingredients such as turmeric powder, sambar powder, cumin and little tamarind juice. There is no need for any soaking or grinding or pressure cooking. Sometimes you can prepare a tastiest dish in a matter of minutes. 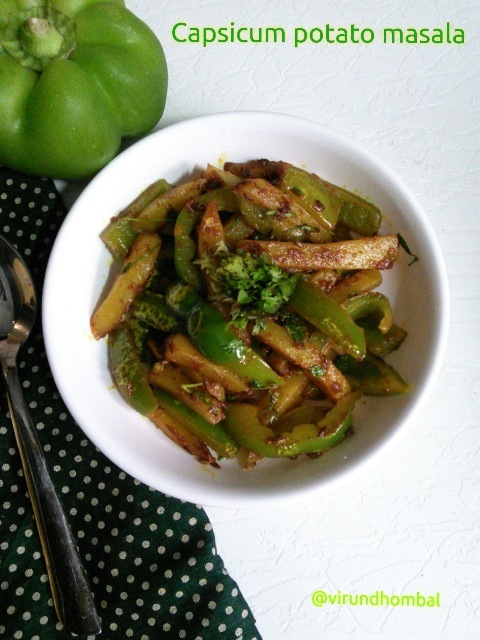 This capsicum potato masala is one among them. You can serve this masala for chapathi, jeera rice, coconut rice, lemon rice and curd rice too. I frequently prepare this easy and quick masala for lunch. This masala tastes so good if you serve right after you prepare it, because the crunchiness in the capsicums will be lost if you prepare in advance. So follow the simple instructions and prepare this easy masala for your family. Clean the capsicum and slice off the top and bottom. Remove the seeds and cut into thick long strips. Wash and peel the potato skin. Cut them into long strips. Heat 1 tbsp oil in a kadai for about 2 minutes. Add the cumins fry for a second and add the potatoes. Add the turmeric powder and saute it in the oil for a few minutes. No need to add any water. The potatoes must be cooked in the oil itself. Check the potatoes are done by pressing the potatoes with the ladle. If they are soft, add the sliced capsicums. Saute them well and add the required salt. 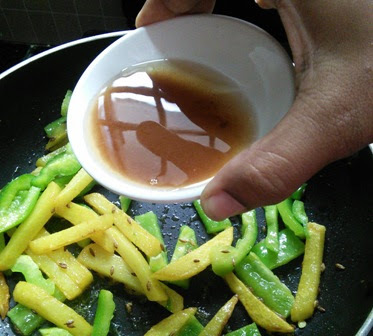 Saute it for a second and add the tamarind extract. 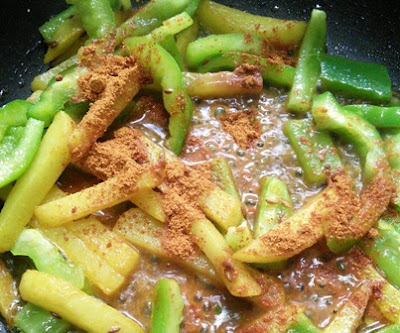 Mix them well and add the sambar powder. 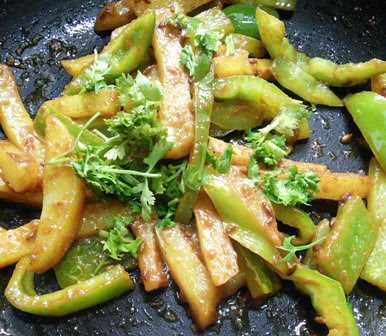 Gently toss them well with the capsicum and potatoes and add the chopped coriander leaves. Switch off the flame and transfer them to serving dish. Serve it immediately with chapathi, poori or any rice. 1. 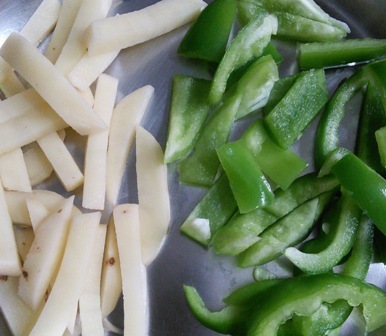 Clean the capsicum and slice off the top and bottom. Remove the seeds and cut into thick long strips. Wash and peel the potato skin. Cut them into long strips. 2. Heat 1 tbsp oil in a kadai for about 2 minutes. Add the cumins fry for a second and add the potatoes. Add the turmeric powder and saute it in the oil for a few minutes. 3. No need to add any water. The potatoes must be cooked in the oil itself. Check the potatoes are done by pressing the potatoes with the ladle. If they are soft, add the sliced capsicums. Saute them well and add the required salt. 4. Saute it for a second and add the tamarind extract. 5. Mix them well and add the sambar powder. 6. 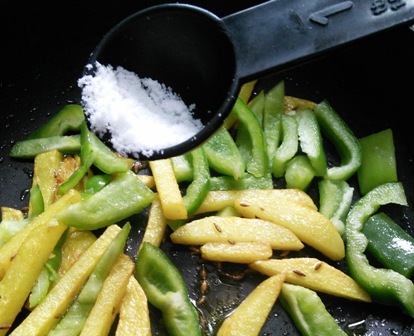 Gently toss them well with the capsicum and potatoes and add the chopped coriander leaves. 7. Switch off the flame and transfer them to serving dish. Serve it immediately with chapathi, poori or any rice. If you try this recipe for Capsicum potato masala send us your comments below and share the recipe for your friends and family.